During the 12th century, Britain experienced a renaissance of history writing. Foremost among the authors who were vying for best-seller status, William of Malmesbury wrote 'Acts of the English Kings' and a history of the church ('Acts of the Bishops'. He was following in the footsteps of the Venerable Bede (8th-century author of 'History of the English Church and People'), whose information and cause-and-effect method he borrowed. Nevertheless, William warned his rivals that he was due credit for all the work of compiling the material since then. A Benedictine monk, William travelled widely to collect his material on church history and included a good component of anecdote to ensure popularity. He finished the first version about 1125 and updated it in 1142 with the 'Historia novella'. This manuscript of the 'English Bishops' belonged to the Cistercian Abbey of the Blessed Virgin Mary, in Byland, Yorkshire. 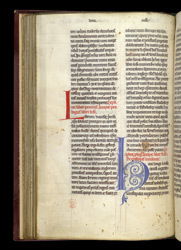 The first 'book' (section) of 'Acts of the Bishops' covered the early archbishops of Canterbury. The second chronicles early bishops of all the dioceses and kingdoms of England. Starting in the first column with the red inscription, the prologue gives a framework of the different regions. London, beginning with Erkenwald (675), heads the chapters on early bishops.